You might already know that members of the International Brotherhood of Electrical Workers/Electrical Workers Minority Caucus (IBEW/EWMC) Local Union 26 are highly skilled at wiring large commercial projects. But did you know that many believe so strongly in the value of their work that they use their skills for good, strapping on their tool belts to help community members in need? Late last year, the chapter participated in a day of service in partnership with the District of Columbia Housing Authority. 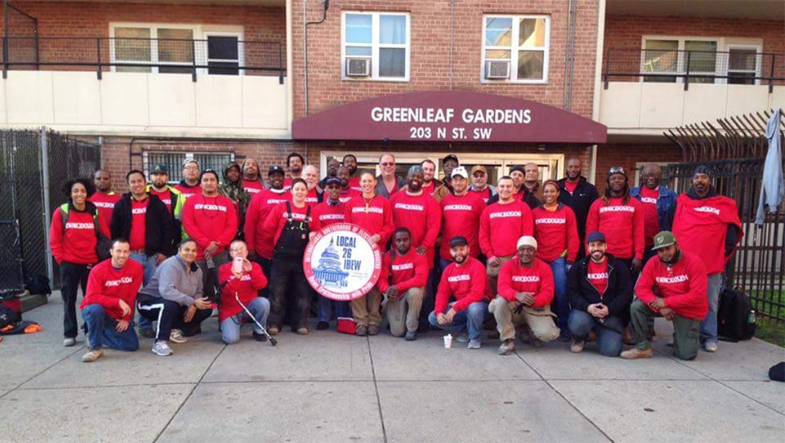 At Greenleaf Apartments in southwest Washington, D.C., members helped bring vacant units up to code and prepare them for occupancy, changing out outlets, adding switches and lights, and installing hood ranges, smoke detectors and garbage disposals. Forty-two volunteers gave their time for this half day of work, preparing apartments and enabling families to move into their new homes sooner. In April 2017, these skilled volunteers will be at it again. They will gather to ready apartments at another D.C. Housing Authority property, Stoddert Terrace. Three similar projects will take place later in 2017. In addition to the satisfaction that comes from providing needed services, chapter members enjoy the camaraderie of volunteer work days. People from the Council of the District of Columbia and the D.C. Housing Authority are invited to join. “A lot of us have worked together for years. It’s good to see people you’ve not seen for a while,” said Robert Smith, sergeant at arms of the Washington, D.C. chapter of the EWMC. The projects with D.C. Housing Authority began three years ago and are the latest in a long history of volunteerism for the group. Each year, members who attend the EWMC national leadership conference join the national day of service in the conference’s host city. Throughout the year, the D.C. chapter holds three to five of its own community service projects, a tradition that started in 2007. In one of these projects, volunteers installed ceiling fans to bring comfort to residents of Christ House, a shelter and medical facility for the homeless. Volunteers have installed lights and exit signs for the Boys & Girls Club of Greater Washington. For Toys for Tots DC, group members fixed 100 bicycles to be given to children for Christmas. The list goes on, showing that when you need good work that comes from the hands, head, and heart, members of IBEW/EWMC Local Union 26 can help.